Question: Is it allowed to show the truth of the Torah or try to prove its truth in different ways like the words which appear in Torah at equal interval skip distances. Answer: I was surprised and wondered about such a foolish question. It does not require thought. It is simple. It is a great mitzvah to do it. In every generation the Sages of Israel, who were the experts to answer the atheists, used ways appropriate to their generation to prove the truth of Torah. Look at the tractate Hulin, page 60b. The Sages ask: Was Moses a hunter or did he know all the animals in the world, [to be able to say that the only ones which chew their cudd and do have split hooves or which do not chew their cudd and do have split hoofs are the ones mentioned in Torah?] The Sages answer from here that Torah is from Heaven. For only G-d knows the characteristics of all the animals. Since the facts show that this kind of proof has a great impact to strengthen the faith that Torah is from Heaven, it is a great mitzvah for those who occupy themselves in these matters. But they must be on a level to properly deal with this on a scientific basis. They must not be like the people who do not know enough who spoil instead of rectifying. All those who occupy themselves in these matters will be blessed by G-d in all blessings which are for those who help others to be more meritorious and bring back those who are far away. Their hands should be strengthened. Heaven forbid, they should not be discouraged by any pious and righteous arguments because those who are arguing out of piety, do not speak with sense. It is better that they should keep quiet.. Blessed will be those who establish words of Torah. 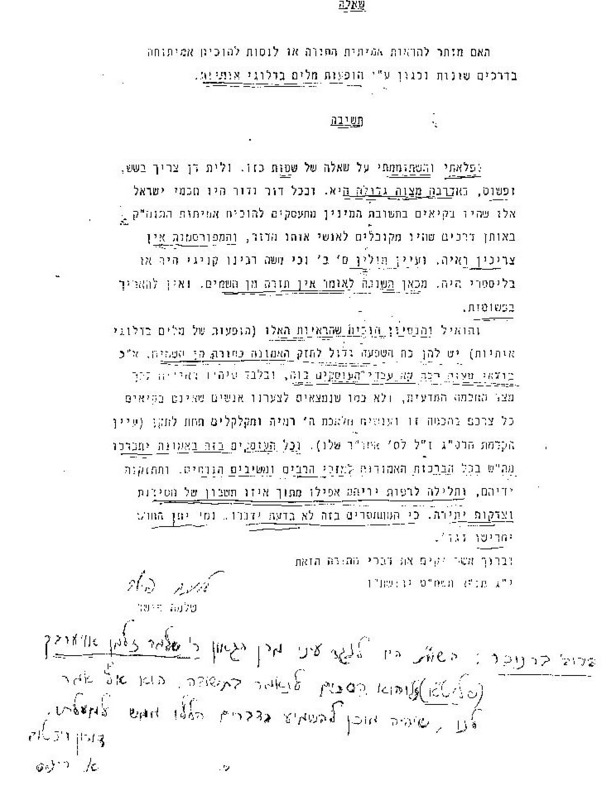 Rabbi Shlomo Fisher This answer was shown to the Gaon Rabbi Shlomo Zalman Oyarbach by Professor Branover. Rabbi Oyarbach said that he would say the same words. A number of contemporary Gedolim and Torah sages have repeatedly given their strong support for the use of Codes as a Kiruv Rechokim tool. Included in this prominent group is the renowned Jerusalem Posek and Rov, Rav Shlomo Fisher. 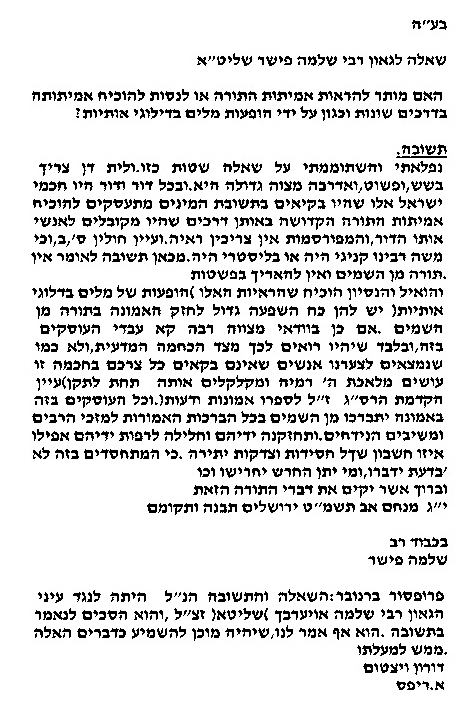 In addition to his own 1989 Psak Din stating that "it is a Mitzvah to teach Codes," Rabbi Fisher recently issued a public letter wherein he states that he met with Doron Witztum and Dr. Rips on several occasions, together with Rav Shlomo Zalman Auerbach, Zt'l. He testifies that Harav Auerbach not only gave his unequivocal approval of the Codes research but also strongly encouraged the use of this material in Kiruv Rechokim efforts.